To she who is illusion, to the auspicious yogi, who is Sashti Devi, my salutations. To get rid of violence and anger, who is Sashti devi , my salutations. Yasavinam Cha Rajendram, Sashti Devi Prasadatha. 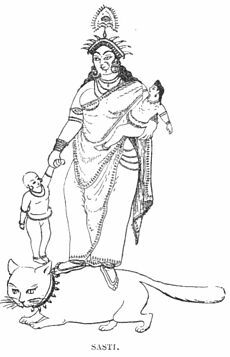 Sarva Paapa Vinirmuktha , Maha Vandhya Prasooyathe.